Diane wearing a Jill Booth scarf, with Barry Crocker. The lake at Karnak seen from the ampitheatre. Diane playing host to a group of Artquest visitors. Diane at Karnak with Heinz Steinmann painting. 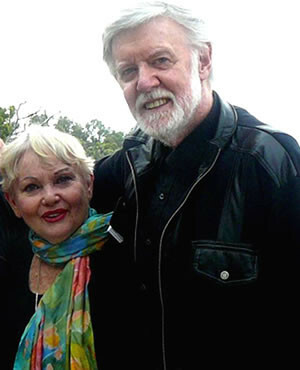 Diane Cilento, iconic actor, producer, writer, theatre owner and staunchly pro-active North Queensland identity, died in Cairns on October 6, 2011. From making her own tropical rainforest jam, tearing around on her ‘ride-on’ (the lawnmower), to graciously presiding over wonderful performances and events at Karnak, memories of Diane are of her seemingly boundless energy and interest in the Arts of the Douglas region. 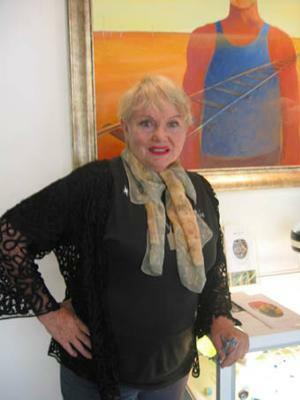 What fun we had at the Sheraton Mirage Hotel all those years ago when, complete with red wig and an autocratic manner, she 'became' Tiggy Puggenheim, who ‘owned’ the hotel and the exhibited artworks that she had commissioned from visiting Perth artist, Leon Pericles. More recently she kindly 'opened' the Go Troppo Arts Festival in the historic Sugar Wharf, thus supporting yet another Arts event. The most recent of her public appearances was a delightful speech that she gave in late September 2011 as she opened Tania Heben's exhibition at Cairns Regional Gallery, all the while looking elegant and gorgeous. Come to think of it, Diane was indirectly one of the reasons that my husband and I came to live in Port Douglas. In 1984 we were living in an idyllic spot on the banks of the Murchison River in Kalbarri, Western Australia, where we owned a caravan park. My main artistic pursuits in those days were making stoneware pottery and sculpture and screen-printing my own designs onto fabric and T shirts. But although we loved Kalbarri and the surrounding National Park, adventure called, in the form of a lovely brochure about Port Douglas and Far North Queensland. Now, we had never heard of this tiny town and it was not yet a resort destination. But we were immediately attracted to it because of the lovely, generic brochure, with not an advertisement in sight, for which, I later discovered, Diane had been largely responsible. So we towed our ‘pop-top’ caravan the four thousand odd kilometres, via Darwin and the ‘Top End’ to see it for ourselves. A second trip (this time towing a boat) and a six-month stay decided us that this was where we wanted to live. A few years later, when we had built Mowbray Gallery in the rainforest near Port Douglas, Diane was a regular visitor to our exhibitions. 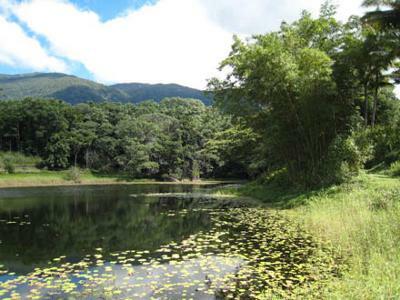 She had not long previously realised her dream of building a playhouse in the rainforest beside the lake, surrounded by mountains, on land that had once been a sugar plantation and on which she had planted an assortment of tropical fruit trees. Fantastic performances were held in the amphitheatre by Jane Rutter , Barry Crocker, Lorna Luft, Wilma Reading, the Kransky Sisters and many other famous actors, musicians and painters, including, in 2010, ‘Woman Before a Glass’, starring Diane herself. Now Karnak has been beqeathed to the Queensland State Government so we hope that they are in a position to accept such a wonderful gift, thus assuring that the unique concept continues. 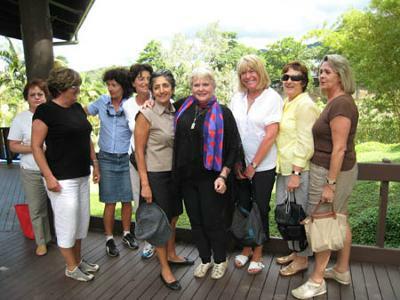 Diane’s generosity, professionalism, loyalty and down-to-earth good sense will be sadly missed by the Arts community of Port Douglas, Mossman and Whyanbeel. We extend our sympathy to her family and close friends. My sympathy for the family. She has touched so may people and their lives, all received so much from Diane.